Cut the meat into pieces for stewing. Fill a pot half full of water. Add the meat, salt, murri, vinegar, oil, pepper, caraway and coriander seed crushed. Bring to a boil and reduce heat. Boil gently for 10-15 minutes until meat is teder. Remove the meat reserving the broth. Wash the artichokes. Cut off stems and crowns. Remove hard leaves. When only light green leaves are showing, rub the surface with a slice of lemon. Bring the broth to a boil, adding more water if necessary. 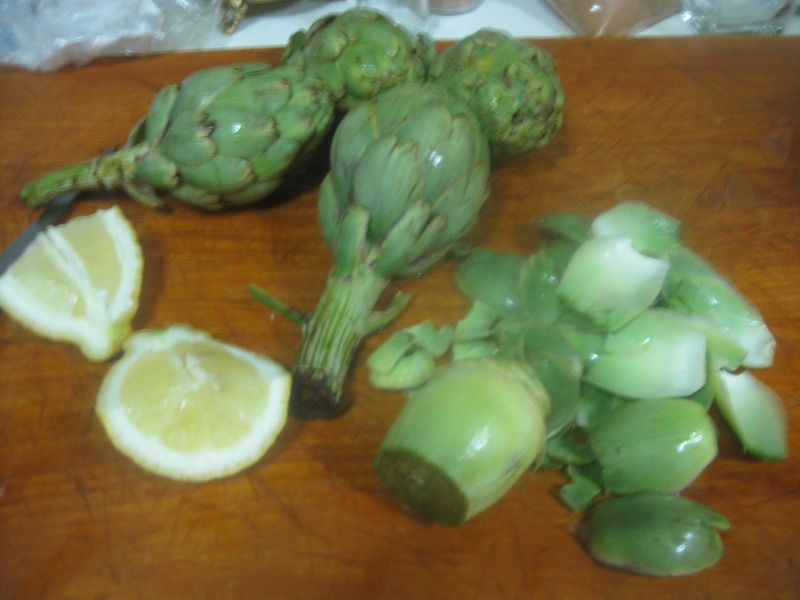 When boiling add the artichokes. Reduce heat and gently boil for 35 minutes. When cooked quarter the artichokes. Dice the meat into small pieces. Add the beef and the artichokes to the pot. The Anón Al-Andalus now instructs to cover the contents of the pot with two eggs and breadcrumbs. Pour the artichokes and meat with a little broth into and oven-proof dish. Sprinkle a very thin layer of breadcrumbs on top. Beat the eggs and pour over the breadcrumbs. 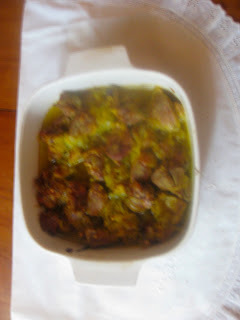 Cook in the oven for 10 minutes or until the eggs solidified. Sprinkle pepper on it and serve, God willing.